One last excerpt from Tracy Chevalier's The Lady and the Unicorn, recounting the moment when the weavers cut the finished product off of the loom. The cutting-off is a good day for a weaver, when a piece you have worked on for so long-- this time eight months on the one tapestry-- is ready to be taken off the loom. Since we are always working on just a strip of tapestry the size of a hand's length, which is then rolled inside itself onto a wooden beam, we never see the tapestry whole until it is done. We also work on it from the back and don't see the finished side unless we slide a mirror underneath to check our work. Only when we cut the tapestry off the loom and lay it face up on the floor do we get to see the whole work. Then we stand silent and look at what we have made. He concludes by saying, "That moment is like eating fresh spring radishes after months of old turnips." This picture below is of Hashmiya right after she cut off her piece that is now in Kantara's' inventory. "We went back to the warping, with us pulling, Georges cranking, Aliénor testing. It was not so much fun now. My arms ached too, though I would never have admitted it... Madeleine huffed and sighed and sulked next to me and Nicolas began rolling his eyes in boredom. "What do you do after you finish this tedious task?" he asked. We thread the heddles, to make the shed," I said. Nicolas looked blank. "Heddles are strings that pull every other thread apart so that you can run the weft through them," I explained. "You push a pedal and the warp separates into two. The space between those sets of threads is the shed." "Where do you put the tapestry as you're weaving it?" "It gets wound onto this beam here in front of us." Nicolas thought for a moment. "But then you don't see it." "No. Only the strip you're working on, then it gets wound on. You don't see the whole tapestry at once until you've finished." Nicolas' confusion and surprise mirrors my own. How do the artisans know what to weave next? Unlike the Brussels' tapestries in Tracy Chevalier's, The Lady and the Unicorn, Moroccan rugs do not have convenient paint-by-number cartoons behind them indicating the next design. In fact, oftentimes several women weave on the same rug in silence, all instinctively knowing what comes next. At one point in The Lady and the Unicorn, Tracy Chevalier walks us through the old ritual of laying the warp from the point of view of Christine du Sablon, Georges, the master weaver's wife. As you recall, the warp is made up of the vertical threads of the textile. These are the threads that are initially set up on the loom, while the weft threads are the ones that are woven through, horizontally, once the loom is properly dressed. We had already begun preparing the loom for weaving-- setting the warp threads into a raddle and attaching them to the beam at one end of the loom. Now it was time to wind the warp onto the back beam before attaching it to the front beam to make the surface to weave on. Warp threads are thicker than the weft and made of a coarser wool as well. I think of them as like wives. Their work is not obvious-- all you can see are the ridges they make under the colorful weft threads. But if they weren't there, there would be no tapestry. Georges would unravel without me. To warp a loom for a tapestry of this size you need at least four people to hold bundles of warp threads and pull on them while two men turn the roller to wind the warp around the back beam. Someone else checks the tension of the threads as they go. That must be just right at the start, otherwise there are problems with the weaving later on. In Morocco, the process of laying the warp is slightly different with two women sitting besides two stakes that have been driven into the ground at a distance. A third woman walks between them looping her ball of yarn around the stakes. Around and around and around. The two sitting women ensure that the tension around the stakes is uniform. At the end of all of this, the artisans slide the warp onto loom beams and the actual weaving process is one small step closer to beginning. According to a report by the Food and Agriculture Organization of the United Nations, "the Atlas and Rif mountain types (previously known as Berber) are the most ancient and primitive sheep in Morocco, as illustrated on rock paintings of the Stone Age." These sheep dot the countryside, from the coastal plains through the Atlas Mountains. 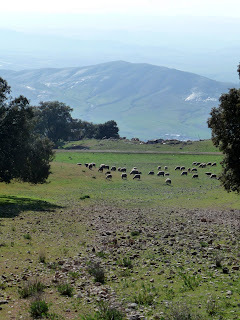 It would not be a normal day in Morocco if you did not see several herds grazing along the side of the road. I was on the lookout for Barbary Apes which live high up in the cedar forests surrounding Azrou, but instead, all I found were these flocks of sheep on the picturesque mountainside. Sheep rearing and shearing is so important in these parts that when natural environmental disasters occur, the villagers often tally the number of sheep deaths alongside the number of human deaths. While shearing does occur here and most women know how to card and spin their own wool, the larger cooperatives that I work with tend to buy their wool, already dyed, from large companies in either Casablanca or Rabat. 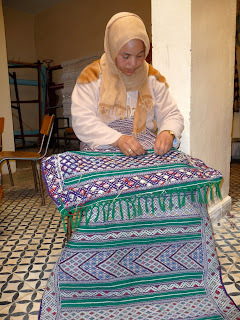 In several parts of the country, such as the southern regions near Taznakht and the eastern reaches of the Beni Ouarain tribe, it is more common to see thicker pile rugs made out of natural wool. These rugs often have three colors: white from white sheep, black from the black sheep, and gray which is made by carding and spinning the black and white wool together. Yesterday I went to the Museum of Natural History, to check out the different weaving styles from around the world. Not surprisingly, there were many different styles of prehistoric weaving spindles, looms, and other tools from Asia, South America, and Africa. Each region varied slightly from the others. The three types of looms that were the most prominent, however, are backstrap looms (of Peru and the Andes), vertical looms (of certain regions in Africa, including Morocco), and horizontal looms (responsible mostly for cloth production). This is a typical vertical loom from Southern Morocco with the beginnings of a pile rug on the warp. 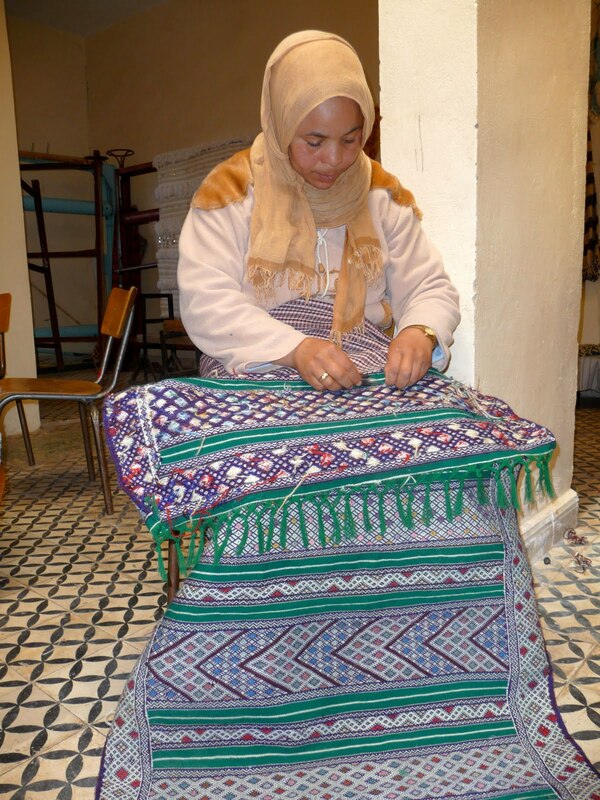 All of the rugs produced in Morocco come off of vertical looms, while other types of looms are used for cloth and the material for Amazigh tents. This loom currently resides in my living room. As this will be my first project, I've decided to make a scarf with a sampler rose path pattern that runs across five vertical stripes.